Today is my baby’s due date but doesn’t look like something would happen. I won’t be able to dine out soon so we went to a wine bar called “Toratatsu (meaning Tiger Dragon in Japanese)”. This bar is the second Izakaya (Japanese drinking establishment which also serves food to accompany the drinks) bar of Shiru-Bay in Yaletown. The bar opened in the area of Denman x Robson street where many popular Japanese Izakayas are. The bar’s size and atmosphere are similar to Bin 941 on Davie Street. My husband said he likes this bar because he doesn’t get the usual Japanese Izakaya welcome – waiters and cooks shout at customers saying “Irasshaimase (welcome)”. Their tapas menu is reasonable and have lots of varieties. We liked Deep fried chicken tortilla and Deep fried prawn with chili and mayonnaise sauce. They have more than 30 kinds of wine and they also have Kyoto’s famous tea from Tsuen which was perfect for pregnant women like myself. I was very happy sipping delicious Japanese tea. 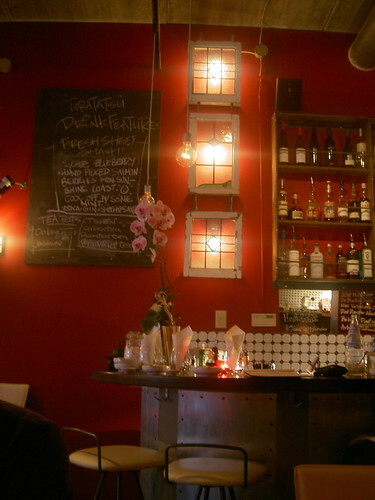 There are many Izakaya bars in Vancouver where you can go with lots of people but this place will be suitable when you want to have a relaxing time with your boyfriend or girlfriend. stumbled across your blog when I Googled Toratatsu. My friends and I hope to check them out this weekend. Any food photos from this restaurant? I love everything izakaya. ☆Phil, it was too dark to take pictures of their food. The menu is not so big but very tasty. Yeah, it’s a good time to visit the bar now since it’s not so crowded at the moment.